All summer long we have been organizing in communities to win elections! You can help with a donation of $50 or attend a canvass near you! The Resistance Summer project in Nebraska has a Grassroots Organizer in all three of our Congressional Districts. The Grassroots Organizers work with volunteers to talk with Nebraskans of all parties in order to understand what we need to do for the people of our state. Democrats across Nebraska and the country will knock on 200,000 doors! 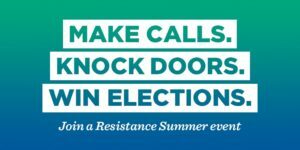 There are 3 different ways you can get involved with the Resistance Summer program! We can set you up with a Virtual Phone Bank online and you can do it anywhere that you have internet. Just contact your organizer or I and we can walk you through that! You can also contact an organizer and we can mail or email you a list to canvass or call! We are working hard to make sure whomever would want to get involved can! So just reach out and we will be there! With the Resistance Summer Project underway, one could say things are heating up at the Nebraska Democratic Party. Our goal is simple, to dive back into our communities and discover what issues are most important to our neighbors. On Saturday, July 15th we participated in a National Day of Action which coincided with a hundred of other canvassing events across the country. In the first congressional district, we took to the sidewalks of Lincoln to talk to members of the community about what issues are most important to them. Their responses ranged from education to healthcare, to increasing funding for parks and trails, but the greatest response was how happy they were someone was wanting their opinion. There is no one way to place every response and opinion into a neat box, and it would be unrealistic to try. Instead by gathering this broad range of information from our neighbors, we will be able to find and elect candidates who best represent our values. This week was wild, and crazy, but thanks to dedicated volunteers we were able to make contact. From our National Day of Action I met a volunteer whom, after he returned was so excited about the conversations he had with people. He spoke about how people were thrilled to have someone at their door who wanted their opinions, and to care about what they thought. He was so excited that two days later he hit the sidewalks again to talk to members of our community, clipboard and pen in hand. He entered the office on Tuesday just as excited and rallied as he was on Saturday. As Democrats, stirring up this excitement and enthusiasm in both our volunteers, and members of our community, we are sure to leave a meaningful mark in the towns, cities, and neighborhoods we live in. Canvassing this week was an adventure! On Wednesday I was out going door to door when I came across a man as liberal as he was opinionated. He was thrilled we were conducting these surveys, and when his first issue was “impeach the Trump administration”. His black and white cat chimed in with her opinions as well, but as I left the house to continue on, it began to downpour! I of course was on the opposite end of the neighborhood from my vehicle without an umbrella, and ended up getting slightly lost on my hustle back to my car. Needless to say I was soaked when I returned, but I had fun out in the neighborhoods, and that is the thing that matters. When we went knocking on last Saturday, we found out a handful of people were not pleased about Trump. They also mentioned Healthcare, Education, and Taxes as the issues that popped out the most. I went door knocking with two of my former co-workers and they really enjoyed it. We found out some people do not want to talk much but a main issue we heard this week was healthcare, integrity, and Trump. They are appreciative that we are there talking with them and not concerned about their vote. We addressed that we are here to listen to what they are worried about and it was nice to hear that they actually want to talk to us instead of slamming the door. Some of the things I have encountered was that former volunteers are obviously upset about what happened this past year, but do not want to do something about it. Some feel the need to blame the party that we have not done enough. After explaining this program to them, some want to help and others are still weary about it, but glad we are doing this. People are always up for the challenge, but we have to show that we can still fight for what they care about. This week felt like a slow week but finished a strong week. Even though it felt like a lot of people didn’t want to talk, I had a majority of the people canvassed mention healthcare which is good because they have been paying attention to the news. I talked to people that were happy that the party is going out here to listen to their concerns for 2018 and the future. I am having more people canvass and willing to help out the party. This only helps that other Democrats want to help out the party sooner rather than later. Nevertheless there are wonderful pockets and large communities of Democrats across the state. I have enjoyed hearing from folks of the struggles of being a Democrat in this red sea of Republicans, many struggles on the growing list along delightful success stories of progressive change. I have seen the population numbers and we still have room to grow the party. The work that lies ahead is to speak with registered voters through social media, direct phone calls and face to face on the front porch. The people of Nebraska want to be heard and they want their thoughts recorded down on paper. We must bring them direct action with results. They will not cross party lines nor leave their couch on election day if we don’t reassure them that we care. They want to see us at the fair, the parades, at the city hall and school board meetings fighting for the issues that we wrote down on paper. Now along the way I may have missed one or two of you, possibly even a whole group of folks in one of the dozen counties, but my hope is to reach you all. It’s been many years since a statewide candidate has visited you or the Democratic Party has given you the time of day but with our new Chair Jane Kleeb and the new national Democratic Party leadership we are visiting small towns and rural communities. I need your help to make the phone calls, check in on folks that have dropped off the page and offer folks more praise than criticisms on social media. The doors must be knocked, the questions must be asked, action must happen in order to get more Democrats elected. It has been a rushed week full of events and very passionate heart felt discussions with folks over the phone. There are people all over Nebraska concerned about the dismantling of the Affordable Care Act. This healthcare concern crosses party lines and the stories are heartbreaking that many folks wouldn’t be alive without the medical access or completely broke from skyrocketing prescription costs. My thought is that I should wear a t-shirt that says how did you pay your medical bills? I attended the Kearney County fair in Minden, Nebraska which was enlightening to the political makeup of Republicans voting for Hillary and Democrats voting for Trump, just a few issues swung their vote. But people wanted to tell their stories, they wanted to be heard. Many folks feel left behind or discarded and by listening in and writing down the most important remarks voters make it reassures them that you care a little. They may be how we win in some of these local elections and statewide races may come down to a few votes. Nebraskans are steeped in poverty with incomes drying up with the mismanagement of our state government by Governor Ricketts. But we must give them a hope of something better or they will reluctantly for these folks back into office. My final words of wisdom are that we must boldly go where we have never gone before and engage with folks of diverse backgrounds and strange ideologies so that we might learn and so that voter will again feel connected to a greater purpose. These last few days have been pretty gloomy with a dash of presidential doom. While talking with folks across Nebraska the worry of the healthcare act repeal kept coming up.The president was determined to throw out the affordable healthcare act and force devastating further cuts to medical programs, like medicare, medicaid and healthcare assistance access. I have been hearing on the streets and on social media the disgust with the proposed repeal and replace with no real medical plan. We rallied again in front of Congressman Adrian Smith’s office for access to healthcare and celebrated the anniversary of the Americans with disabilities act. My mother reminded me that my grandmother received free healthcare after she contracted the polio virus at the age of twenty five. She lived in poverty and he first daughter was born in the Nebraska polio ward. Kathleen Hendrickson had four children after the polio virus nearly killed her. The years to follow any injury would never heal correctly, she worked a taxi job, paid her taxes, raised a family of five, two twins, and nearly thirty grandchildren. She was a strong advocate for accessible spaces, fair schools, president of a polio survivor group, and the proud grandmother of one special politically minded grandson. Ultimately I would not be here today without affordable health care and the belief that healthcare is a right to everyone. But I know my story is not that unique, if we were to spend the time getting to know our neighbors we would find many more stories of how healthcare helped or hindered their journeys. The overwhelming medical debt that people have been carrying around does influence their votes. The cost of healthcare is too high in America and Nebraska could have expanded medicaid to drive down cost but the elected officials couldn’t get that done. Many rural and urban folks in Nebraska are suffering, the prisons are full of individuals who needed mental health services years ago, and the state economy has plummeted to the bottom. People are feeling the pain and need someone to confide in. My hope is that we the brave few Democrats in Nebraska will stand up, speak out, make calls, knock doors and walk across the aisle as the party of real health, help and that great HOPE of better days to come.